The Sony A330 and Sony A380 have been removed from the official Sony website. Oh yes, its time for the new Sony A390! Do you really thought Sony would let us wait until Photokina (in September) before to release some new Sony Alpha Sony Alpha Sony Alpha Sony Alpha Sony Alpha Sony Alpha Sony Alpha Sony Alpha Sony Alpha Sony Alpha Sony Alpha Sony Alpha Sony Alpha cameras? According to rumors found on asian forums (and from reliable sources) at least three new Alpha cameras are going to be announced during the next few months. The next camera to be announced should be the Sony A330 successor (the Sony A390). 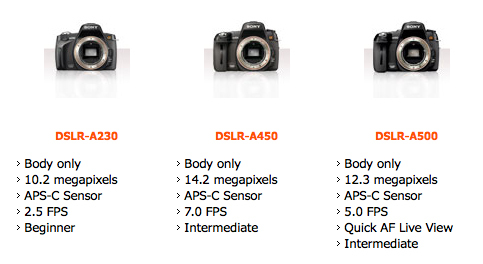 And Sony will also upgrade the very popular Sony A550 ! There will be two (yes two!) Sony A5xx cameras with ExmorHD sensor. We don’t know what the difference will be between the two A5xx cameras. We only know that they will have the same Sony NEX Sony NEX Sony NEX sensor. Expect also some new features to find it’s way inside the cameras. As usual, please link to sonyalpharumors when you post the rumor on your website/forum. Feel free to send me your rumors at sonyalpharumors@gmail.com.